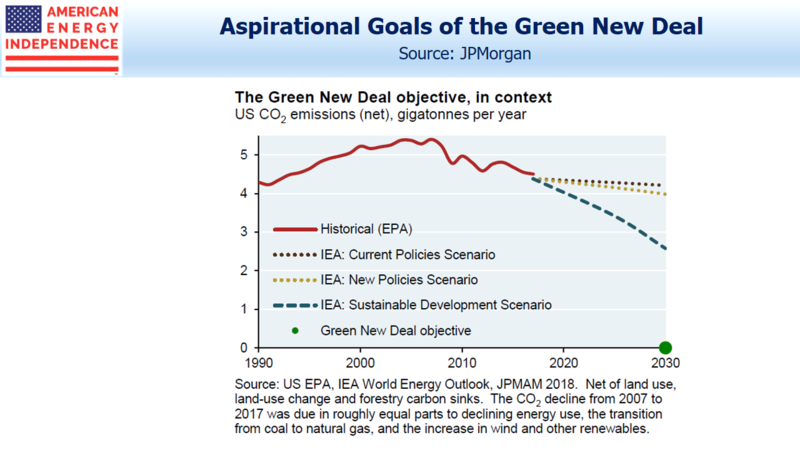 JPMorgan’s recent Eye on the Market: Energy Outlook 2019 is the best analysis we’ve seen of the Green New Deal (GND). Author Mike Cembalest, whom I know from when I worked there, as always takes a balanced approach supported by insightful research. These and related objectives would represent a “Herculean effort” that is unfathomable over the next decade. Even with the necessary political and public support, this would be a path to a 40% drop in CO2 emissions by 2040, versus the GND’s goal of 100% by 2030. If anything, the GND’s unattainability should drive support for significant spending on flood remediation projects, as Cembalest suggests. The conversion of electricity generation to solar and wind receives lots of attention. But electricity represents only 17% of primary energy use. 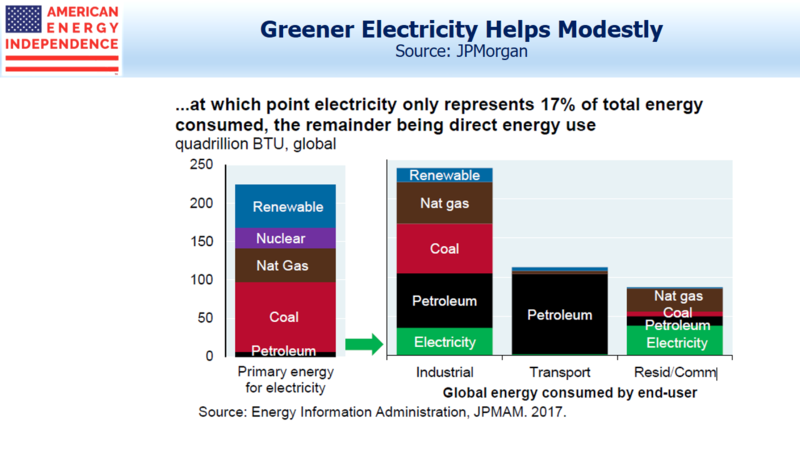 A sobering related statistic is that 2/3rds of the primary energy used to generate electricity (coal, natural gas, renewables etc.) gets lost through thermal conversion, power plant consumption and transmission. The three big end user sectors of energy are industry, transport and residential/commercial buildings. Industry is more than half – production of cement, steel, ammonia and plastics are the “four pillars of modern society.” Many industrial processes require high heat and temperature, and while electricity can theoretically replace natural gas, it’s 3-5X more expensive. Moreover, that’s based on today’s electricity, which is itself 2/3rds derived from fossil fuels. A 100% renewable electricity supply would be even less competitive. Lowering greenhouse gases globally can’t happen without China’s active participation. They produced more than half of the world’s cement in 2017, half the steel, and a third of the ammonia, all substantially used domestically. 85% of ammonia is used in fertilizer, without which the world could only feed half its current population. 40-70% of ammonia used in fertilizer is lost due to leaching or erosion. Its production causes 1% of global Greenhouse Gases (GHGs). The world currently generates around 34 gigatonnes of CO2 annually (a gigatonne is a billion tonnes). The International Energy Agency (IEA) expects global GHGs to increase by a third over the next two decades with unchanged policies. Rising living standards in emerging economies, led by China and India, will swamp greater energy efficiencies in the developed world. Use of plastics (produced with methane, naphtha and ethane) is forecast to rise by 150% over the next thirty years. The GND promotes planting more trees. 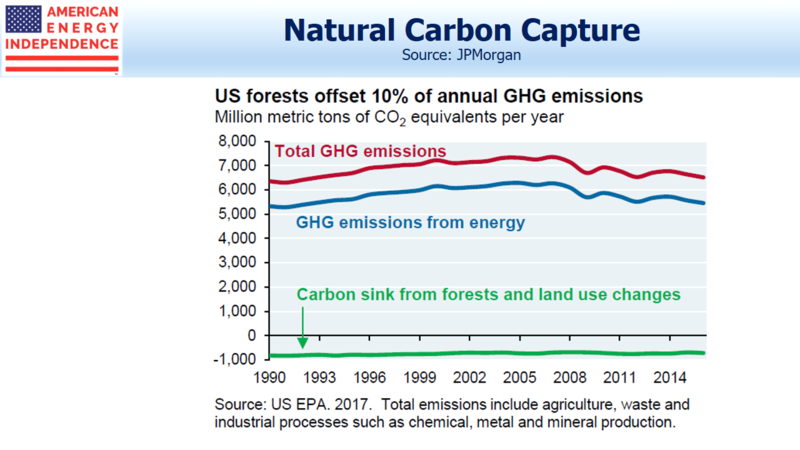 U.S. forestland of 750 million acres captures 10% of emissions. A 2017 study found that replanting trees on 20 million acres of cleared land could offset almost 1% of U.S. GHGs. This would be challenging; current U.S. Forest Service efforts are 120 thousand acres, around 0.5%. Germany’s “Energiewende” has impressively lifted their renewable share of electricity generation to 38%. However, emission reductions are disappointing. Phasing out of nuclear power, and renewables intermittency (it’s not always sunny and windy) have increased use of coal. Further use of wind requires substantial investment in transmission infrastructure to link the windy north with population centers in the south. 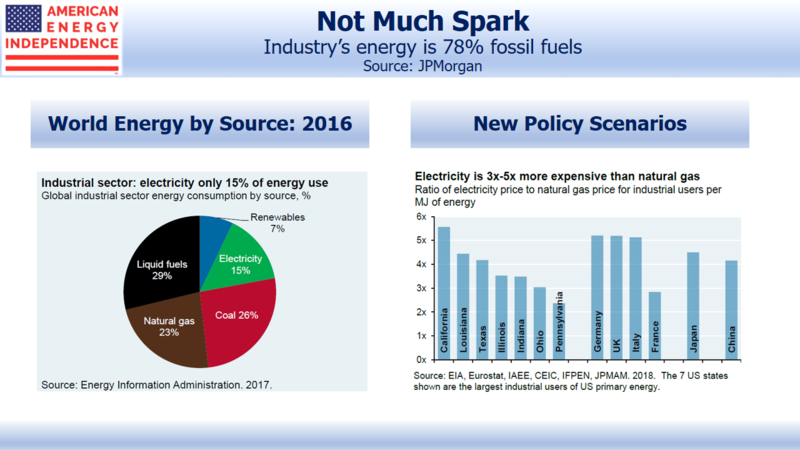 Energy Outlook 2019 ranks among Mike Cembalest’s best pieces of work. It’s highly readable.